Venezuelan President Nicolas Maduro announced on Sunday a 30-day plan to help deal with the power outages across the country. Maduro blamed US-backed 'criminals' for power shortages. Alicia Jrapko, co-director of the National Network of Solidarity with Cuba, spoke to Sputnik about Washington’s pressure on Venezuela and how it affects Cuba. According to Alicia Jrapko, US's "intense aggression against Venezuela is also aimed at Cuba". She explained that the US is well aware that "if Venezuela falls, then it would be easier for them to act against Cuba". Cuba is being targeted because the Caribbean nation is an "example" to the rest of Latin America and the world that you can live without kneeling before Washington. "The plan of the United States has always been to overthrow the Cuban government, there has never been any interest in establishing diplomatic relations with Cuba. The United States believes that Latin America is their backyard. If a country becomes independent, like Cuba, which was disobedient, they try to overthrow its government." "During Obama's time in office, we were very optimistic, but deep down we knew that this was unrealistic. The United States has never forgiven Cuba for nationalizing its industry, never forgiven its independence and the fact that it is an example of solidarity throughout the world. Despite years of blockade, Cuba can provide its people with free health care and education. The United States sees a danger in Cuba being an example to the rest of the world." The US is stepping up pressure on Venezuela but Cuba is a constant target as well. The ongoing attacks against Cuba by Venezuela's self-proclaimed president, Juan Guaidó, seem to confirm the words of Alicia Jrapko. 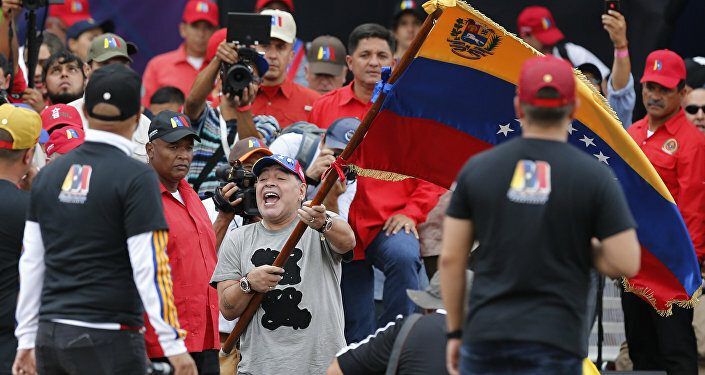 For example, the opposition leader, who has strong support from the US, has repeatedly called to stop "giving" oil to Cuba, stating that Venezuelan oil shipments to the island leads to a loss of more than $2.5 million a day in profit. "Why do they attack Venezuela? Because they attack any country that uses its natural resources in the interests of the majority of the population. This is a brutal attack on Venezuela. They are trying to convince the military, and are investing money there." Jrapko also noted that this is one of the many false statements against the legitimate authorities of Venezuela. "It is not true. There are agreements between Venezuela and Cuba. […] We are in such a difficult situation that we have to fight to prove that what the media says is not true. In the case of Venezuela, the lies are huge. […] We found out that images of an empty supermarket in Venezuela were actually images from New York." Despite all the difficulties, Jrapko is confident that Latin American countries will resist US pressure. "We must rely on the resistance of Latin American countries. Mass demonstrations in support of Maduro are being held. […] Cuba has shown us that, despite the blockade, it continues to develop its own program that people have chosen as a way of life, and no one can tell them what they should do. I don't think the United States has achieved its goal, but still the enemy is very strong," Jrapko concluded.